•Ambassador Chijioke (left): A Mike Tyson? The battered wife (right). The embattled Nigerian Ambassador to Kenya and the Seychelles, Dr. Chijioke Wilcox Wigwe, who was recalled by President Goodluck Jonathan in May after reports emerged that he almost beat his wife to death, has gone back to his post, reports said early today. The reports said the ambassador has been sent back to Nairobi, the Kenyan capital by President Jonathan who acted against the wishes of his advisers and Kenyan authorities. The advisers argued that allowing the ambassador to go back to work will set a negative precedent about wife beating. The ambassador’s wife, Tess Iyi Wigwe, petitioned the Kenyan police in May urging them to promptly arrest the diplomat before he beats her to death. In a letter she sent to Mr. Mathew Iteere, the Commissioner of Police, the distraught wife accused her husband of battering her and causing her serious bodily harm which has sent her to hospital many times, often between life and death. The ambassador denied all the allegations. He was recalled to Nigeria after the incident. NAIROBI (AFP) – Kenyan jets struck in Somalia Wednesday in a bid to rid the border area of Islamist rebels blamed for a spate of abductions, including that of a French woman who died in captivity, officials said. Kenyan ground troops guided by pro-government Somali forces prepared for a fresh assault against the Shebab insurgents with the blessing of the Western-backed government in Mogadishu and its Ugandan protectors. Nairobi’s unprecedented military incursion into Somalia, which it said had already killed dozens of Shebab fighters, triggered dire warnings by a top Shebab leader of bloody retaliation. The foreign ministry in Paris announced the death of Marie Dedieu, a 66-year-old wheelchair-bound woman snatched from her beach house in the Kenyan resort of Lamu earlier this month and taken to Somalia by her kidnappers. “Our aircraft are involved in the operations,” army spokesman Major Emmanuel Chirchir said, on the fourth day since Kenya declared war on the Shebab militia. Heavy air strikes are reported to have been hitting Shebab positions in efforts to dislodge the militants, before Kenyan-backed Somali government ground troops move in to drive out rebels, according to witnesses. Analysts say Kenya wants to carve out a buffer zone along the border, but Shebab forces said Wednesday they were preparing a counter-attack. “We have been gathering information on the Kenyan army’s strength, in terms of weapons and manpower,” Sheikh Abdulaziz Abu Musab, a Shebab spokesman, said on the group’s radio Al-Andalus. The main forward base of Kenyan operations is at Qoqani, some 100 kilometres (60 miles) from the border, as they prepare to push forward to seize Afmadow, which Somali government forces are already fighting to secure. “In terms of injuries, the first attack saw the death of 73 Shebab,” Chirchir said, adding that the only Kenyan deaths were five killed in a helicopter crash. A Kenyan police source however told AFP there were casualties. Security forces are planning a “major operation in Nairobi to get rid of Al-Shebab,” Assistant Security Minister Orwa Ojode said Wednesday, a rare admission from the government the Shebab threat exists even in the capital. The Shebab deny any involvement in the recent kidnapping of foreigners, which have raised questions about Kenya’s ability to host the million tourists who visit each year and one of the world’s largest aid communities. Kenya’s decision to invade came after a British tourist was snatched from a Kenyan resort last month, the French woman from her beachfront home in Lamu and two Spanish aid workers from Dadaab refugee camp last week. A French government statement said “the conditions of her detention and the fact that the kidnappers probably refused to give her the medication that we sent her” likely led to her death. Insecurity in southern Somalia is making it “almost impossible to establish significant cross border humanitarian operations,” the UN humanitarian affairs agency OCHA warned Wednesday. The UN describes the food crisis in drought-hit Somalia as the world’s worst ongoing humanitarian disaster. Uganda, which provides the bulk of the 9,000-strong African Union force protecting the Western-backed Somali government in Mogadishu, welcomed the operation and said Kenya had the right to defend itself. However, the African Union stopped short of backing the operation. “I don’t say support, I say understand the motivations of the operations, in order to put an end to the capabilities of the Shebab,” said Noureddine Mezni, AU spokesman, in response to a AFP question. Analysts say Kenya has sent at least 2,000 troops into Somalia, but the military would not comment on operational figures. Ethiopia had tens of thousands of troops in Somalia for two years but failed to root out the Shebab and establish a robust central government. Last week, Safina party leader Paul Muite and four others said they intend to sue a Moses Kuria over the contents of a Facebook message regarding the Kenyan case at the International Criminal Court. Mr Muite is said to have asked for an apology or retraction from Mr Kuria within seven days, failure to which the case would proceed to court, which it now has. In a statement on Facebook, Mr Kuria said the law suit was tantamount to curtailing his freedom of expression, and argues that what he posts on the website cannot be construed as libel. “To accuse me… is presumptuous, naïve and betrayal of a 19th Century mindset on the part of the gentlemen. It is understandable [they would] find social media alien,” said Mr Kuria. Facebook statuses are typically short statements posted in response to the question ‘what is on your mind?’ which are then shared on the popular social media website among the users network of friends. Depending on an individual’s privacy settings, this statement can be broadcast to the entire Internet population, or it can be limited to the followers that a single Facebook user. The Muite/ Kuria case will be a precedent-setting for several reasons; it is the first such ‘Facebook’ case in the history of Kenya, and the court’s decision could dictate how the country handles similar cases involving social media and other new technologies. Kenyan law already allows mobile texts to be accepted as evidence in court, and some suspects have already been prosecuted on the strength of SMS texts they sent to others. Extending a stricter legal focus to Facebook would open up the growing numbers of people on the website to tighter scrutiny by law-makers. The Kenya’s Facebook population is said to over 600,000 – the single largest grouping of Kenyans on any Internet site – with some industry estimates placing the population at over one million. Going by estimates that claim the average Facebook user updates their status three times in a week, this means at least 1.8 million statuses a week in Kenya are potential lawsuit magnets. This is not just a concern in Kenya. Globally, most Facebook—related lawsuits involve libel cases, where a company or individual defame another person or company using the website. Coming in a close second are cases where people have broken employment terms using the website. This is where the infamous status updates where an individual posts that they had ‘a fabulous time at the party last night’ and are ‘still nursing a hangover’ when they had earlier told their employer they were nearly on their death beds or sick at hospital come into play. Several employees around the world have been fired for posting status updates in variance with what they tell their employer they are up to, setting the stage for a claim that the employee breached the terms of their employment. Employers are also becoming increasingly vigilant about what their staff members say about their companies or their competitors firms, and many now have in place social media guidelines that if breached can lead to the employee being fired legally under law. Facebook users can also be sued for copyright infringements if they use someone else’s material without permission, which should cause all those who are fond of using a celebrity picture as their identification picture some pause. No matter how private you may think Facebook is, you can be sued for whatever you post. 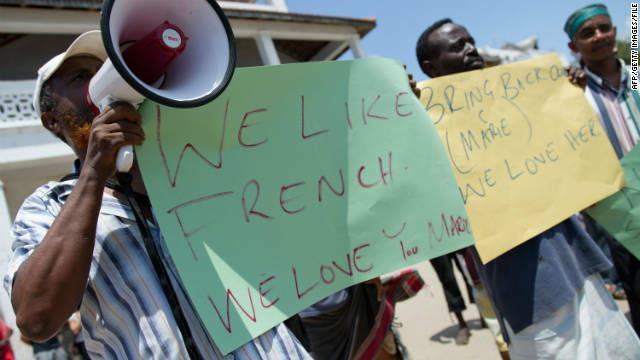 Local Kenyan hoteliers hold placards supporting the return of kidnapped Marie Dedieu earlier this month. (CNN) — A Frenchwoman kidnapped from her holiday home in northern Kenya and taken to Somalia has died, the French Foreign Ministry said Wednesday. A gang of 10 armed men seized Marie Dedieu this month from her home on Manda Island, prompting a sea battle between Kenyan forces and her abductors. Kenyan officials sent mediators into Somalia a day later to negotiate her release. Dedieu lived in a luxury home on the scenic Lamu archipelago for about six months out of the year. Kenyan officials and an acquaintance said the woman, in her 60s, used a wheelchair and was not in good health. “The contacts through which the French government was trying to release Marie Dedieu … have announced her death,” the ministry said in a statement, adding the date and circumstances of the death cannot be specified. The ministry said Dedieu’s death “is almost sure” even if it does not have her body. “Marie Dedieu’s health, the uncertainty about the conditions of her detention, the fact that the abductors had probably refused to give her the medication we had sent her, make us think that this tragic end is unfortunately the most plausible one,” the ministry statement said. Dedieu’s friends and relatives have been notified, it said. The Kenyan government sent its condolences to Dedieu’s “family, friends and colleagues” in a statement Wednesday. “The kidnapping and detention of Marie Dedieu was a terror act not only against her, but also against Kenya, her home country France and the entire world,” the statement said. 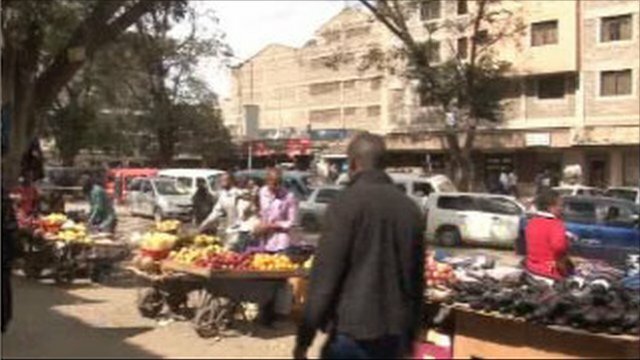 Dedieu’s abduction was the second in the area in a month, a major blow to Kenya, which relies on tourism dollars. Gunmen seized British tourist Judith Tebbutt and killed her husband near Lamu last month. Security analysts have said Tebbutt is being held by pirates in a remote corner of Somalia. British government officials have asked journalists not to reveal her exact location to avoid abduction attempts from rival gangs. France and Britain warned travelers to avoid the Kenyan coastline near Somalia in the wake of the abductions. Kenyan officials have said they believe the kidnappings are carried out by the Al-Shabaab Somali militant group. A third incident involved the kidnapping of two Spanish aid workers at the Dadaab refugee camp last week. Kenyan forces crossed into Somalia this week to pursue the militant fighters after the kidnappings heightened tensions in East Africa. In the statement Wednesday, the Kenyan government said operations against Al-Shabaab were continuing. Two 18-year-old men from Cardiff have arrived back in the UK after being deported from Kenya. Mohamed Mohamed, and Iqbal Shahzad were detained by the Metropolitan Police under the Terrorism Act, after flying into Heathrow Airport at 17:00 BST. The men were arrested close to the Kenyan border with Somalia, over suspected links to Somali militants, but were not charged in Kenya. It is expected they will be questioned by South Wales Police. The father of Mohamed Mohamed, of Somali descent, alerted police and flew out to find his son. It is understood no charges were brought against Mr Mohamed and Iqbal Shahzad, who is of Pakistani descent, by the Kenyan authorities. They were deported on Wednesday after questioning by the police’s anti-terrorism unit. Abdirhman Haji Abdallah alerted the High Commission in Nairobi as well as the Kenyan police and gave them a photograph of his son. Security forces arrested his son Mohamed very close to the Somali border along with his friend. Mr Abdallah said he was reunited with his son in Nairobi where police said they would not prosecute as he had not crossed the border into Somalia, but would refer the matter to the UK authorities. The case of the 18-year-olds, understood to be missing from Cardiff for more than a week, was discussed at a community meeting in the Grangetown area of the city on Sunday. A joint statement from the Muslim community in Cardiff said the Somali and Pakistani community in particular, and the Muslim community in general, are anxiously waiting for the arrival of the pair. “The families of the two youths are thankful to God that they are both safe and well,” said the statement. Cardiff South and Penarth MP Alun Michael said there had been a very positive response from the local community. “From what I have been told they are two bright, intelligent young men who have got their lives before them,” said Mr Michael. The arrests came against a background of an air and ground assault by Kenya into Somalia at the weekend. Somali militant group al-Shabab has warned Kenya to withdraw its troops from Somalia, or face bloody battles. Kenya had responded to several recent cross-border abductions it blames on al-Shabab. All animals are [genetically) equal but some are more [financially] equal than others. Maj (Rtd) Phillip Moi found himself in very unfamiliar circumstances a fortnight ago when a judge issued a warrant for his arrest. His crime? It was alleged that he failed to pay Sh60,000 to his estranged wife Rosanna as earlier ordered. This order was only lifted when his lawyer proved that the cash had indeed been deposited with Rosanna’s lawyer. Rosanna Pludo’s lawyer finds it difficult to believe that the son of a wealthy former president is unable to come up with Sh250,000 every month to support the life his estranged wife and children have grown accustomed to. Mr Moi’s protestations that he is a retired army officer living on a fixed pension have been dismissed by his opponents as untrue. To outsiders, members (especially the children) of prominent family businesses appear to be a homogenous group of people, relatively indistinct from one another. It is easy to assume that each has the same access to financial resources, each is endowed with similar (if not identical) business acumen and that each child occupies the same place of prominence with the parents or the leader of family business. This assumption may lead one to believe that associating (by friendship, work or marriage) with a member of this prominent family is a direct line to the family’s business resources. While I have a number of good friends who have married into prominent families purely out of love, many others I know of, both men and women have made the decision to marry into a prominent family business as a strategy to grow their businesses or as an avenue to a cushy lifestyle. It’s easy to tell the difference between them; it’s in the longevity of the relationships. The expectation that a wealthy extended family will take responsibility for a member who has fallen upon hard times is common. It is common to see and hear prominent people berated for the desperate state in which their relatives live and unthinkable that a rich parent would let his /her own child, their flesh and blood, languish in poverty. Many times, this expectation is misplaced as demonstrated in the case of Warren Buffet, one of the richest men in the world. When Peter Buffet, second son to Warren Buffet, turned 19, he received an inheritance of $90,000 from the sale of a farm which his father converted to Berkshire Hathaway stock. Warren Buffet made it clear to his son that this was the entirety of his inheritance and that he should not expect anything more. Given the elder Buffet’s commitment to devoting his wealth to philanthropy upon his death, it is fair to assume that he meant exactly what he said to his children. The young Buffets used (squandered) their fortunes in different ways, with Peter choosing to sell his stock (which would be worth about $72 million today) to test the waters of music recording. He has since become a moderately successful composer based in San Francisco and found such satisfaction in his calling that he wrote a book “Life is what you make it; find you own path to fulfilment”. This is the lesson from one of the richest families in the world : That every family has its own intricate dynamics and may operate on principles that seem bizarre to outsiders. The expectation that Philip is inextricably tied to his father Rtd President Moi with some obligation that the latter will come to the help of the former in times of distress may be based on false assumptions. Philip entered the marriage relationship as his own man with the belief that the resources he had on hand were adequate to support a family. It is also possible that he had received all that was due him from his father at an earlier date, with the clear understanding that he would make his own path in life. Love being what it is, it’s also possible that Rosanna came into the same arrangement starry eyed and filled with expectations that the safety net in such a prominent family as the Moi’s would save them from any financial hardship. It appears that both were sadly mistaken. The mismatch of expectations is obvious from the court proceedings and they are all bracing for the battle ahead.